Ducati.ms - The Ultimate Ducati Forum > General Discussion > Welcome and Introduction > Ahoy! I'm Shiro from Belgium and I've just bought my dream bike a few weeks ago. 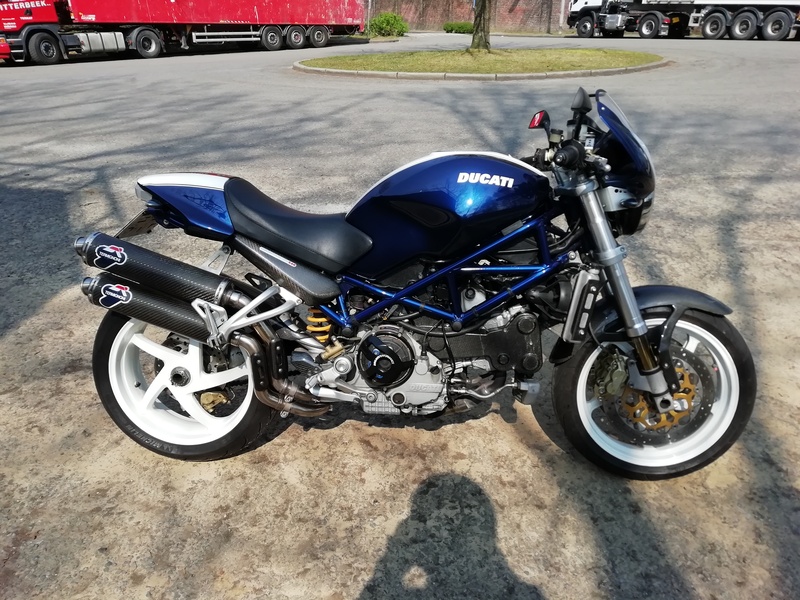 I've joined here as it seems to be the most active Ducati forum, and perhaps one day I might require help from here as the bike I bought has been terribly neglected by its previous owners. Still currently fixing it up, though. The bike in question is a 2005 Ducati Monster S4R 996 pictured below. Cya! Hi Shiro and welcome, glad to have you join and be a member. Very nice Monster. Welcome! One of the most beautiful Monsters imo. That blue really pops. By that pic it doesn’t look neglected at all. Except maybe those square mirrors. Does it need a valve/belt service and tune up? Has the bike been sitting a lot? Thanks, guys. The bike doesn't look neglected because I've been cleaning it already, but up close there's a lot of dings and scratches, even on the frame itself (which then rusts). What you can't see is that the front brakes are dragging, front wheel bearing is busted, oil radiator is in bad shape, cracked gauge cluster glass, broken brake pedal... there's more but it would be a long list. I can't tell if the bike sat for a while, but it did have some spiders hiding in it. It was kept outside. Upon initial inspection, the belts didn't seem to be old, but I can't service them as I lack the tools. Same goes for the valves. I've fixed all I could, but now she'll be heading to a Ducati dealer for service. She's kinda dangerous with dragging brakes and a busted wheel bearing. Hang in there. It’s a beautiful bike. Rebuilding brake calipers isn’t too crazy, takes some patience, and YouTube. Best to you and you’re new ride.